Your web page is showing just fine on FireFox and Google Chrome, but not on I.E. When you created your content on CampusGroups, you probably did a Cut & Paste of some text from MS Word/Outlook or from an I.E. web page. When you did so, you also pasted some invisible MS HTML tags which often end up truncating the content on Internet Explorer Browsers (only). CampusGroups is programmed to detect these tags and will alert you when when it sees them in your content. Go back to edit the content you saved in the HTML Editor. Select it and cut it (CTRL X). The HTML Editor should become empty. Click on the "Paste from Word" button. 4. 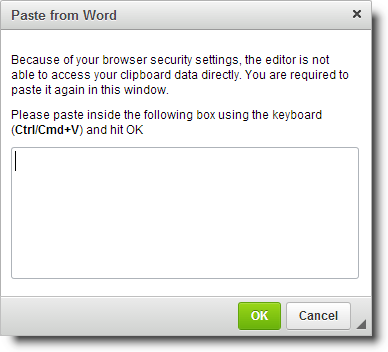 Paste your Content into the Popup (CTRL V) and click OK.
5. Click on 'Save & Preview'. Some of the formatting might have been lost so you would need to add yourself where necessary.